This 'Keepsake Rose' necklace features a classic look that will complement your stylish ensemble. The rose bud twinkles with a single round brilliant cut diamond, totaling .05 carats. 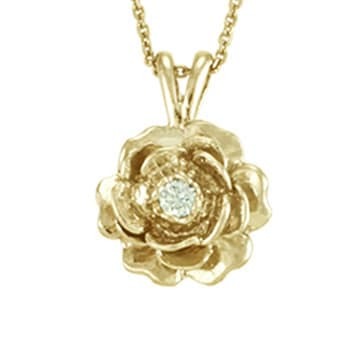 The layers of rose petals are crafted from 14k gold, and is available in a white, yellow, or rose gold finish. This piece is sure to accent any outfit and is stylish year round. All carat weights and measurements are approximate and may vary slightly from the listed dimensions. *T.W. (total weight) may vary and is a minimum of 0.05 carat. Treatment code N. See Gemstone Treatments for further information.